In 2013, the Arizona Legislature passed HB 2455, to prevent the destruction of valuable firearms by lower levels of government in the state. No penalties were imposed. Some cities, especially Tucson, refused to obey the law. In 2016, the Arizona legislature passed SB 1487. The bill allows a state legislature to file a complaint with the State Attorney General if a local government passes a law that “violates state law or the constitution of Arizona.” If the AG finds the complaint to be valid, the local government entity has 30 days to rescind the law. If they do not, the AG is to direct the State Treasurer to stop sending state funds to the government entity. The Tucson Police Department has destroyed 4,820 guns turned in by residents or seized from crime investigations since the beginning of 2013, city records show. The figure is at the heart of a complaint made by state Rep. Mark Finchem, who is arguing Tucson is violating a 2013 Arizona law that requires the sales of otherwise legal guns obtained by law enforcement agencies. City policies allow only for rifles that are not semi-automatic and shotguns to be sold at public auction. All handguns and semi-automatic rifles taken in by police are destroyed. Roughly 86 percent of the guns that were disposed of in the last 3½ years were destroyed, according to documents provided by the Tucson Police Department. Of the remaining 14 percent, half were put up for sale at auction and half were kept for law enforcement purposes. As all the firearms destroyed were either handguns or semi-automatic rifles, a reasonable value would be about $200 each. We cannot know the exact value, because the firearms were not put up for auction. The city of Tucson destroyed about a million dollars worth of firearms in the last two and a half years. The showdown over illegal firearms destruction is coming to a head in “Old Pueblo.” It remains to be seen if the AG will find against Tucson and direct the Treasurer to withhold funds from the city. Watch this space. Really, destroying a Colt re volver? Do they know they don’t make those anymore? There’s very little in that box that I see that would bring only $200 in the open market. I gladly hand over $200 for that Colt or any of the Ru ger Blackhawks. Heck, I’d probably give it up for that Smith as well. On the other hand, is that a High Point in the bottom right? I’m guessing it’s a Single Six. Definitely SAA. Not a Hi-Point, grip texture is incorrect. Plus no visible mag well. Pretty sure it’s a TEC-22. No kidding. $200 is a frakkin’ Hi-Point. I can’t buy a used pistol for under $300 in the midwest, anything worth having is $400+. It’s almost certainly not a real Colt. Only rich people can afford real Colts, and if they’re rich they are unlikely to commit crimes. I’m guessing the Blackhawks are from some gangster who fancied himself a modern-day Pancho Villa. Also, for the record, you can still get real Colt SAAs from Colt on a (semi-)custom basis, but it will run you at least $1500. I was referring to the DA re volver right in the middle with the rubber grips. The cylinder release is a dead give a way. What makes you think a city like this would only seize guns from real criminals? Many of these may have been taken for some really dubious reasons. More than likely, many of those guns were turned in by ex-wives or widows. I think there is a growing consensus among folks (me being one) who are tired of one law for left-wing (socialist) politicians and another law for the little people, that this is getting old. I hope the AG finds the cajones to throw the book at these worms and hit them in their own personal (as opposed to the public) pocketbook. everything that is wrong with jersey, NYC and Ca is started right there. Politicians MUST be held accountable every single election cycle without fail. I see people say california is a lost cause. Maybe so. But this in AZ, land of the constitutional carry, ect. And you have the same slime in charge there as in CA. nip it in the bud or your next. Two Blackhawks in one box? Yeah, those single action revolvers are weapons of mass destruction, all right. Maybe a third on the upper right with aftermarket grips. Definitely an SAA. Simply put: cities and municipalities are creatures of the State. The State can do as they wish with them, including making them unincorporated. Poli Sci 101. Thus Tucson flushed at least a million dollars down the toilet. What an outstanding fiscal decision. We should change the law so that if they are destroyed they have to be compacted to form more Murdercubes, or melted down to make new guns. Besides, most of these are junky old pieces of junk, and it allows the manufacturers to keep selling us new stuff instead of flooding the market with used stuff. We do need to educate these libbies on the fact that destroying “crime guns” does not stop people (probably repeat-offenders in most cases) from committing crimes. And you have to wonder how many were marked destroyed and yet walked out inside someones waistband under a shirt..
At least the guns in the picture may not have been destroyed, they were turned in at a Phoenix “buy back”. Almost certainly destroyed. 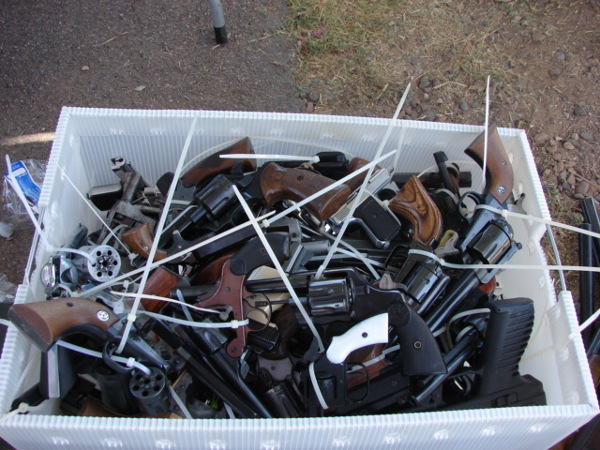 The Phoenix Mayor worked overtime to make sure the firearms collected in those turn ins were destroyed before the law requiring sale went into effect. The revolver in the middle appears to be a Colt Double Action Model 1892. The 1892 was manufacture from 1892 through 1909 and was made in .38 Long Colt and .41 Long Colt. Not an authority on Colt revol vers, but I was thinking it was old with no ejector shroud and those rubber grips were mostly (if not exclusively) pre-depression era. Looks mint, but it could have been reblued and you can get reproduction grips. I’m really curious about that breach open revolver – don’t see too many of those, and we’ll never see that one again. Clearly, they have all the budget they need. I modestly propose that their state funds be immediately reduced by 3x the value they decline to recover, and they be dropped from all expense n recovery-sharing programs. Joint enforcement. Asset forfiture. Like that. Plus, you know, the state suit n criminal charges.